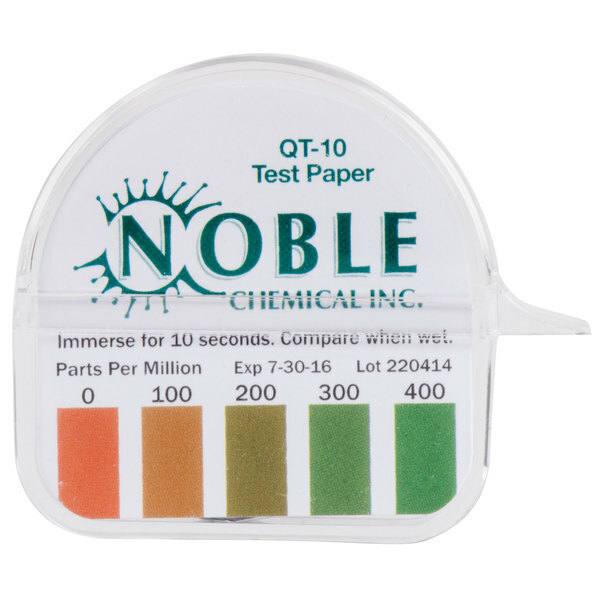 Noble Chemical QT-10 quaternary test paper is the simple, reliable, and economical way to measure the concentration of quaternary sanitizers, including n-alkyldimethylbenzyl and/or n-alkyl dimethyl ethyl benzyl ammonium chloride, and Rocall II. This test paper measures concentrations between 0-400 ppm (parts per million), with color matches at 0, 100, 200, 300, and 400ppm. The distinct color match at each full unit makes it easy for the user to detect exhaustion of solutions that should be replaced. It also helps avoid the use of excessive amounts of sanitizing agents, to avoid wasting product! Simply tear off a small strip of test paper, dip into the sanitizing solution for 10 seconds, then instantly compare the resulting color with the color chart. The paper is held in a convenient, plastic dispensing container. This test's distinct color chart and accurate, reproducible readings give an immediate response for quick and easy use. Includes (1) 15-foot roll of test paper and matching color chart. Provides for approximately 200 tests. Test solution should be between 65 and 75 degrees Fahrenheit. Do not test foam. Contact your Local, State or Federal Health Department for Quaternary Ammonium Sanitizer concentration requirements. These concentrations may vary depending on your specific application. These test strips should not be stored in an area with high humidity or in an area where they may be exposed to water before use.